A New Mac Tip Every Day: No hyperlinks in Pages! Is there a way to auto correct chemical formulas? For example, H2O is changed to H-subscript 2-O? i tried the adding to the auto correct list, but it doesn't allow subscript or superscript entry. I write a lot of chemical formulas and i hate punching the sub and superscript button i placed on my toolbar. It will be great if I can have a auto correct feature that will automatically do that for me. Ideas? The only thing I can think of is to use the 'Apple'-'control'-'-'(minus key) shortcut to switch to subscript (+ for superscript). It might be a bit faster. To Zamil Matter: yes there is a way to use the autocorrect feature to replace h2o with H₂O. First you create the formula H₂O in your document by entering the capital H. Then you open the character palet from the keyboards menulet (that is the little country flag that will be in your menu bar if you choose "show input method menu in menu bar" from the country settings system preference). In the character palet you choose Symbols > Number Symbols and there you will find just below the common fractions like ½, first a row of superscript digits and then a row of subscript digits. You want to insert a subscript digit ₂ from the character palet. 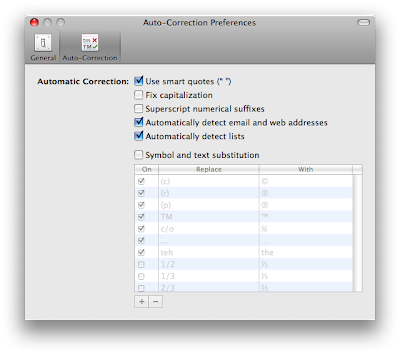 finish your formula with the capital O and copy it to the autocorrect list of the Pages preference window. Now Pages will autocorrect h2o to H₂O. So the trick is not to use the subscript facility of pages.